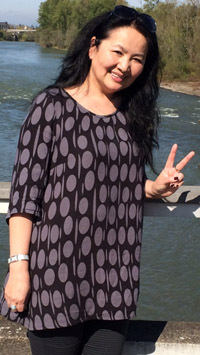 Mandakhaitsetsen "Manda" Urantulkhuur arrived from Ulaanbaatar, Mongolia, last week for a 10-week ELAW Fellowship. This is her first visit to the U.S.
Manda began classes yesterday at the University of Oregon's American English Institute and will work closely with ELAW staff to advance the economic, social, and cultural rights of Mongolia's disenfranchised. Manda is Coordinator of the Community Based Development Program at the Centre for Human Rights and Development. Her program has empowered women's groups in Ulaanbaatar and Darkhan, and the provinces of Uvurkhangai, Dornod, and Khentii. Manda has a bachelor's degree in education from the Pedagogical University of Saint Petersburg, Russia, and a masters degree in Inter-Asia NGO Studies from Sungkonghoe University, South Korea. Many thanks to Michael and SueAnn Rangeloff for being Manda's host family for her first week in Eugene. We will keep you posted on Manda's work.